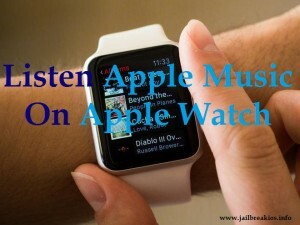 Music and the Apple Watch make a perfect group and via the group users can control playback or interact with your lovely music library using the Apple Wrist watch. Now you can throw out Bluetooth speakers or car radio system, because you can use great listing system on your wrist. Apple watch is the great Apple’s manufactures introducing much more features on your wrist. Force touch, complications on the lock screen, dark mode, multi-tier notifications with “clear all” option, Display touch and workout and activity apps witch are we indicating as the main features of the Apple watch. Apps for news and weather apps, Travel, Entertainment, Sports and various games met as the brand new updates in Apple Watch. Apple music is the main app which all users are finding. So we hope to bring instructions to help for start using Apple music with your lovely Apple Watch. You can extension you’re Apple watch to your iPhone to listen to your favorite music using Apple watch. While listening, Apple watch is working as a remote to control your iPhone’s music library. You can hear the selected music on your iPhone using connected speakers, headsets or itself. If you need to listen your song list offline on your Apple watch, then you will need to follow below steps firstly. Open the Music app on your Apple watch. To display Source and other playback options using force press. Chang the source of the music in the Source. Click on the apple watch to choose your watch as source. Select your favorite song and click on the play button. Bluetooth facility came in Apple watch allowing to connect to fitness and Bluetooth audio devices. Prior to the using these devices, you should make a pair following below instructions. Go to the home screen and open the settings app. Open the Bluetooth settings and wait until Bluetooth to find to device which you need to pair. Click the device name which you need to connect and wait until see the “Connected”. If you already connected you can use the Bluetooth audio device to listen your favorite song. You can give voice command to find your favorite song in your music library and control playback using Siri.